This essay is included in the collected edition of Gianmarco del Re’s Postcards from Italy, originally published by Fluid-Radio and available for download as a PDF here. Postcards from Italy, the album, is the inaugural release from Oak editions, an independent music art label owned and managed by the ambient artists Francesco Giannico & Alessio Ballerini. It is mainly focused on the promotion and diffusion of electroacoustic, soundscape and ambient texture. This label grew naturally out of the Italian Soundscapes Archive also called A.I.P.S. (Archivio Italiano Paesaggi Sonori), which they had founded two years earlier. The sonic response to Gianmarco del Re’s Postcards from Italy series devised by the Archivio Italiano Paesaggi Sonori couldn’t be more fitting. Taken together, the interview series, album and audio-visual installation present more than a simple overview of the current landscape of Italian artists working with sound, though it does this quite well. Postcards from Italy is a nuanced artistic response to the current moment that does not seek to flatten out the contradictions but to make them productive. When we first encounter the poster for the performance at Cafe OTO and the a/v installation at SoundFjord, we see a series of rings spread across an olive green field. In the horizontal version of this poster, these points create an abstract constellation set against a faded ring. This image invites the question: What line can we draw connecting these disparate dots? 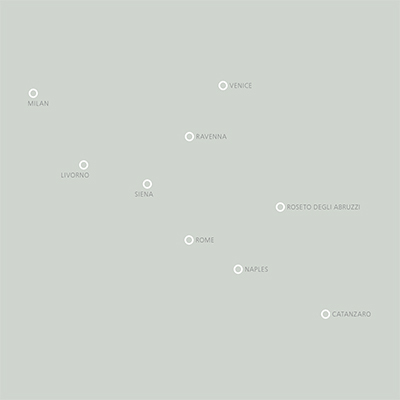 The second poster reveals that each ring represents a city, and the constellation it implies is the Italian peninsula. Nine points, nine artists, and nine compositions, conjuring forth their own fictional landscape. When we look to the classical constellations of stars, we may have to imagine the images but that doesn’t mean that their power is only imaginary. All fantasies are group fantasies, and Italy is no different. Phrased another way, what unites such difference? This is the question of modern Italy, so what hope do I have of offering anything coming close to a satisfying answer? No, rather than something to be solved, it is the tension of this aporia that has been a source of constant renewal and creativity. Italian identity is as defined by its multiplicities as it is by its unity. Postcards from Italy revels in this fact. Like Wordsworth in Germany beginning to write The Prelude honoring his absent homeland, the Italian ex-pat in London has embarked on a campaign of rediscovery, bringing together an eclectic group of artists from all over the Italian peninsula to attend to the question, what is the relationship between identity and place? Perhaps we should start with postcards. It’s easy to forget, but a century ago postcards were big business. One of the earliest of the modern collector crazes, billions were sold during this golden age. Often postcards were sent blank, or with only a signature. Even at its most passive, a gesture in someway akin to “liking” a Facebook status, these cards were not to say anything in particular but as a simple acknowledgement. “I’m here, I’m thinking of you.” Since the birth of writing, recorded communication has perplexed us for its ability to foreground distance, to make someone both present and absent simultaneously. This duality has produced many artistic responses, from Kafka obsessing over rhythms of the postal service, to Bartleby, The Scrivener in the dead letter office, to the anti-institutional collaborations of Mail Art. Originally cultivated by the Neo-Dada and Fluxus practitioners centered in New York in the 1960s, the international Mail Art network grew quickly. By about 1974, postal art (or arte postale) had taken off in Italy, no surprise perhaps considering that Marinetti’s Lettera-Futurista had already explicitly aestheticized the mail during the Great War over half a century earlier. Postal Art is an anti-institutional yet collaborative practice, one that allowed for self-mythologizers and rock journalists to take part equally alongside the celebrity artists of the day. Important sonic innovators like Maurizio Bianchi, a frequent collaborator with many of the younger generation featured by Postcards from Italy, and Nicola Frangione were participants in this network, linking them to artists in the UK, Japan, and North America. There may not have been much of an audience or institutional support for esoteric sound collage or vocal experimentation, but by combining the new found DIY recording of cassettes with the distribution network of Mail Art, new aesthetic forms began to take shape. The cassette allowed users to cheaply record themselves and share their work through the existing postal networks. A sort of sonic postcard, they essentially created the first peer-to-peer music sharing networks. The Internet of course evolved under different conditions, but many of the aspects of Net Art were already present in the discourse of authority, collaboration, networks, and presence that were elaborated with regard to Mail Art. Nicola Frangione’s 1983 Mail Art compilation LP, which featured short submission from dozens of international artists, is a fine documentation of the aesthetic exploration occurring during this era. Perhaps the most important antecedent to Postcards from Italy is Frangione’s 1985 LP Italic Environments. Frangione made various ambient tape recordings from soundscapes he found to be distinctly Italian. These tapes were distributed to six artists who wove these sounds into their own music, and most of the participants took part in a corresponding exhibition curated by Frangione. Not unlike Postcards for Italy, Italic Environments was an exploration of the link between Italian identity and territoriality. At that time the bonds of identity -worker solidarity, regional dialects and cuisines, local goods- were being deterritorialized by neoliberal reform and the acceleration of global communications technologies. Following the Years of Lead and the trial of Toni Negri that resulted in the exodus of the Italian Left, it seems inevitable that artists would react to this shifting cultural landscape by subverting the use of these communicatory bureaucracies. Likewise when reflecting on a similar theme today’s artists can’t help but be shaped by the destabilization of identity in the wake of media privitisation, political scandals, globalisation, ecological devastation, the Bologna Process, the Eurozone, and the Internet. 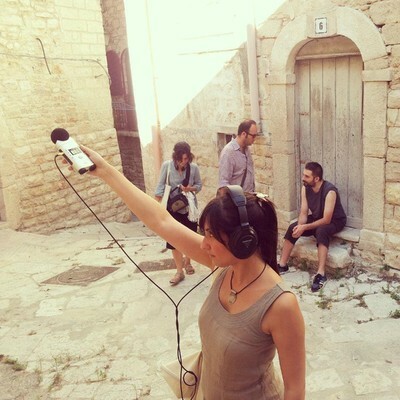 The ability to cheaply make and share recordings cultivated a new approach to electronic music. The relationship between production and distribution is reciprocal; changes to one will inevitably affect the other. Both cassettes and digital file sharing resulted in new types of artists and new audiences, but prior to this electronic music in Italy was very much restricted to an elite which largely worked within the confines of “high art.” The early electronic music studios tended to be state funded, which was necessary to cultivate non-commercial work but also restricted access to a particular ideological or aesthetic viewpoint. In Paris the Groupe de Recherches Musicales (GRM) pursued musique concrète, leaving no room for composers like Eliane Radigue who did not fall within their orthodoxy. Meanwhile the Studio für Elektronische Musik (WDR) in Köln resolutely pursued pure electronic music, stemming from an interest in audio synthesis dating back to before the 1920s. The United States had the Columbia-Princeton Electronic Music Center, which was predictably academic in scope. A bit later the more iconoclastic bricoleurs on the west coast founded the San Francisco Tape Music Center. Despite not being run by the state, this last studio seems most kindred in spirit to an Italian aesthetic, which is resourceful in the face of constraints and willing to find hybrid means to reach their own particular ends. 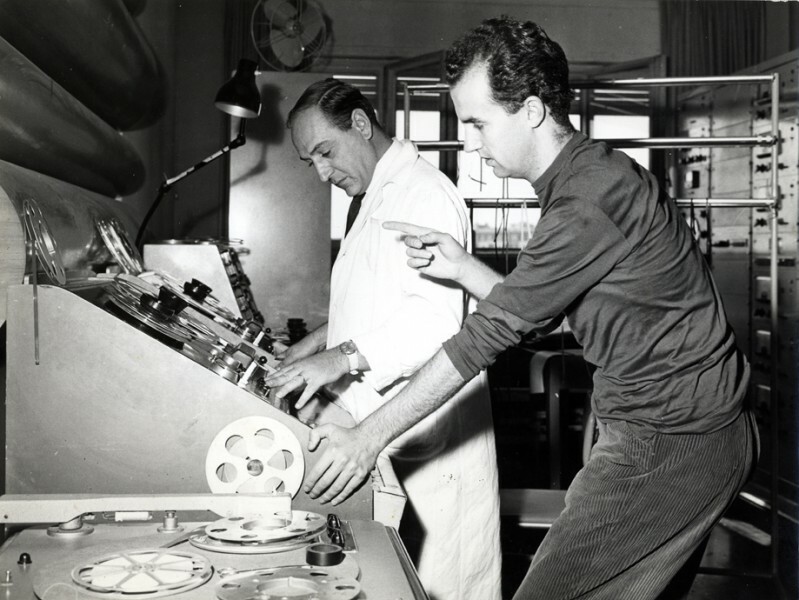 Italy had the studio di fonologia della RAI di Milano from 1955 until it’s tragic and unceremonious closure in 1983, after decades of declining support. The studio was host to such luminaries as Stockhausen, Pousseur, and Boulez, as well as John Cage, who recorded his “Fontana Mix” there. Of course it was also home to some of Italy’s most important post-war composers, namely Luciano Berio, Luigi Nono and Bruno Maderna. The studio’s technician was Marino Zuccheri, a master of sound at a time when organising sound was not yet accorded the same status as composing music as such. He demonstrated the importance a “technician” brings to the creative process, setting the stage for later generations working in this field. Starting out with just nine oscillators and tape, Zuccheri was able to manifest rich new sound worlds through resourceful exploration. Italian electro-acoustic music up until this point was mostly confined to these highbrow practitioners, however the ability to be expressive and innovative working within one’s resources continues to be an important aspect of anything one might call an Italian Aesthetic. Where do virtual postcards fit into this narrative? Like the postcards of the golden age, the soundscapes produced by AIPS serve an archival function while also intervening in the present. Paesaggi sonori is the Italian translation of R. Murray Schaeffer’s concept of the soundscape. Though use of this term has become widespread, it is constantly misapplied since it was first coined decades ago in service of the work of the World Soundscape Project. Schaeffer’s soundscape has an ecological component, and sees itself as making a normative judgment regarding which sounds are “natural” and which sounds are noise pollution. This becomes troubling when the implication is that there is an “authentic” reality that is being conveyed through the medium of audio recording, rather than an always already subjective experience that is inextricable from the medium itself. The soundscapes of AIPS are still concerned with capturing a sense of place and ecology, but the diversity of their methods and subsequent treatment of these recordings demonstrates an openness that is much more interesting, and one which is better suited to capturing the instability of identity in the early 21st century. Matteo Uggeri’s approach is paradigmatic of this. Aesthetically, he is working with the emotional resonance that the recordings have for him, evoking an experience with a particular place. The experience the listener has is coloured by this, though distinct from Uggeri’s. Though the compositions on Postcards from Italy were created using raw material that was distributed anonymously, the act of recording is itself already an aesthetic, and an ethical, act. The artist is already making innumerous decisions just in creating the recording itself, choices regarding subject, duration, microphone placement and/or movement through space. In this way, both artists – those making the recordings and those composing with them- are truly collaborating, adding an additional register of distance and hybridity to an already muddled question of place and identity.